Bundesliga | Leon Goretzka, Arturo Vidal and Naby Keita: Who is the Bundesliga's best central midfielder? Leon Goretzka, Arturo Vidal and Naby Keita: Who is the Bundesliga's best central midfielder? As the European league that has come to be defined more than any other by relentless high pressing, every Bundesliga team now requires an all-action central midfielder to help in those quick transitions, chip in with goals at one end and come to the defence's aid with recovery tackles at the other. 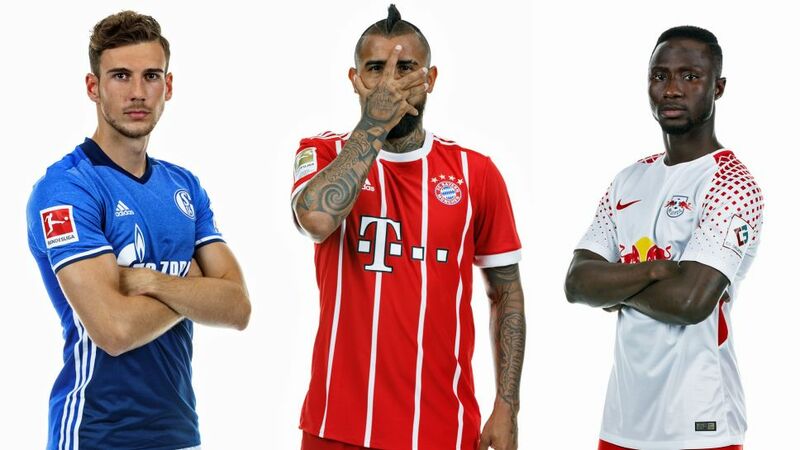 Masters of those arts, three of the best all-action central midfielders plying their trade in Germany at present are Schalke's Leon Goretzka, Bayern Munich's Arturo Vidal and RB Leipzig's Naby Keita. In part due to a change of diet and in part due to Tedesco's alterations to Schalke's style, the 22-year-old has covered more distance and made more sprints on average per game this season than ever before, as well as increasing his percentage of successful one-on-one duels, all key metrics for a central midfielder. The results have been remarkable: Goretzka has already found the net four times, and has the remainder of the season to match 2016/17's tally of five, his best return since joining Schalke in 2013. Two of those goals have been from set-pieces, with the midfielder hammering in a free-kick against Bayer Leverkusen on Matchday 7 and then coolly dispatching a penalty against Hertha Berlin a week later, clear proof of his increased responsibility and importance to this Royal-Blue unit. Goretzka's penchant for important goals was also underlined in a Germany shirt at last summer's FIFA Confederations Cup when he scored a crucial early brace in the semi-finals against Mexico. Those domestic goalscoring numbers are even more impressive when considering that Goretzka has played less than either Vidal or Keita this season. Repeated issues with his lower leg have restricted the club's second-best goalscorer to only 11 appearances (of a possible 18). If a frustrating proneness to injury has hindered Goretzka's development – prior to this term, he had missed over a third of Bundesliga games since arriving at the club – this season has offered a tantalising glimpse into just how good the youngster could be, partly explaining why Bayern continue to make eyes at him. There remains room for improvement – Goretzka has attempted the fewest passes of this trio and has the lowest completion rate – but there are few in Europe better at making a late run (Goretzka's top speed is quicker than any of his counterparts compared here) into the box to grab a goal, the handiest knack in football. Two headed goals (neither Goretzka nor Keita have scored with their head this term), and one from distance underline the unique, multi-faceted nature of the challenge Vidal poses when arriving in and around the box from deep in midfield. Strong as an ox and with the determination to match, Vidal's "warrior" nickname is apt. After struggling for form at the start of the season, it is no surprise that the 30-year-old's improvement coincided with the return of Jupp Heynckes to the Bayern bench; the two had worked successfully together for two seasons in Leverkusen between 2009 and 2011. As well as having two assists to his name (Goretzka has none; Keita one), Vidal has played more passes and returned a higher completion rate than his Schalke and Leipzig counterparts. It's also worth pointing to his 56 long passes (45 of which have found their man) – far more than Goretzka or Keita have played – that indicate Vidal has embraced the deep-lying playmaker role after the departure of Xabi Alonso. Simply put, Vidal is at present irreplaceable for Bayern – the Chilean sets the tempo in midfield, starts and finishes attacking moves and adds a touch of controlled aggression that can knock opponents off their stride. It is little wonder he has featured in every game bar one since Heynckes' return and, if things go according to plan, he will see plenty more action before the season is out. Like the best central midfielders, though, the Liverpool-bound star's skillset is varied and the 22-year-old is capable of making a game move to his rhythm. Although he has played fewer passes than Vidal (651 to 761), the former Salzburg man sees more of the ball than any of his RB teammates as well as attempting and winning more one-on-one duels than any of this trio. Although aerially weak, particularly in comparison to Goretzka and Vidal, there is quite simply no need to play in the air when you can dribble like Keita can on the ground. Indeed, if God had wanted football to be played in the sky, he wouldn't have given Keita the preternatural gifts he has with his feet. Watch: Keita's Top 5 goals! Keita's high number of one-on-one duels is in part due to his propensity to dribble – 58 completed dribbles of an attempted 111 is quite frankly a ridiculous return – with the Leipzig tyro the definition of a transition midfielder, a player who can turn defence into attack in the blink of an eye. That he is the most-fouled of this trio also points to just how tough Keita is to stop once he gets going; despairing of their inability to stop him by fair means, opposition defenders are increasingly resorting to foul means. Involved in 20 goals in 45 Bundesliga games, Keita is no mere dribbler, either, and is more than capable of playing a defence-splitting pass, as his nine assists since arriving in Germany's top flight testify. That said, his own efficiency in front of goal could be improved – requiring an average of eight shots per goal is far more than Vidal or Goretzka, the latter of whom only requires six. Another issue is discipline. Keita will miss Leipzig's trip to Freiburg this weekend after picking up a fifth yellow card of the season against Schalke; he has already missed three top-flight encounters due to a ban this term, while he was also sent off in the DFB Cup second-round meeting with Bayern.